Welcome back! Thank you to all who stopped by and entered the SewPro Blog Hop Giveaway! I appreciate each and every one of you! I decided to record a video of the giveaway. I don't think I've ever recorded myself and posted it on the internet...ever! Congratulations, Kelli! I'm so excited that you won! I've learned a few things about myself by recording this. I say "and" a lot. I look up and away a lot. Oh well. I guess that's who I am. LOL. 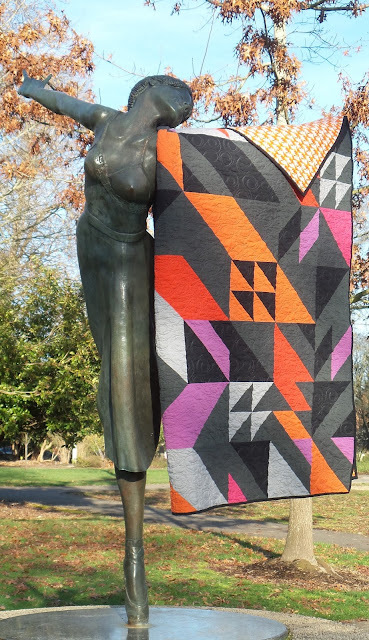 I hope you'll come back to check out my quilty adventures! Even if you didn't win this giveaway, all first-time customers will receive 25% off of the quilting cost! Check out my website for details! Welcome to the SewPro Stars Blog Hop! If this is your first time here, welcome! Let me introduce myself! I'm Lisa (aka Lisa Lisa) and I've been blogging off and on for almost five years. 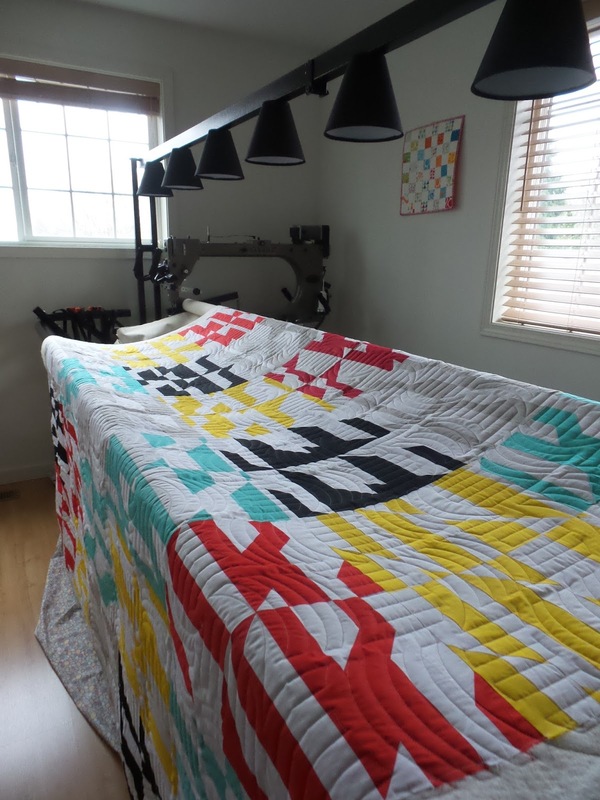 Last year I decided to make the leap and started my very own longarm quilting business, Upstairs Birdie. If you're already following my blog, Facebook, or Instagram, you know that I went to SewPro in September. I blogged about it here and here. And now I'm joining several other SewPro attendees in a blog hop where YOU can win some fabulous prizes! If you haven't read my recent posts, I'll give you a little rundown of what SewPro was all about - Basically, it was a convention to network with others in the sewing industry and to learn about either starting a career in the sewing industry or moving your current business to the next level. Networking with other makers is a beautiful thing! And if you want to really be part of an awesome community of people in the craft industry, then you MUST check out Craft Industry Alliance! Kristin Link of Sew Mama Sew and Abby Glassenberg of While She Naps started CIA, and they were at SewPro to talk all about it. I've been a member since last year, and I can't even tell you how many times I've used their resources (although they probably could because I bet they watch those statistics like hawks!) I'm really looking forward to being able to join one of their monthly coffee klatsches! Each of the blog hop participants is making something that relates to their experience at SewPro. 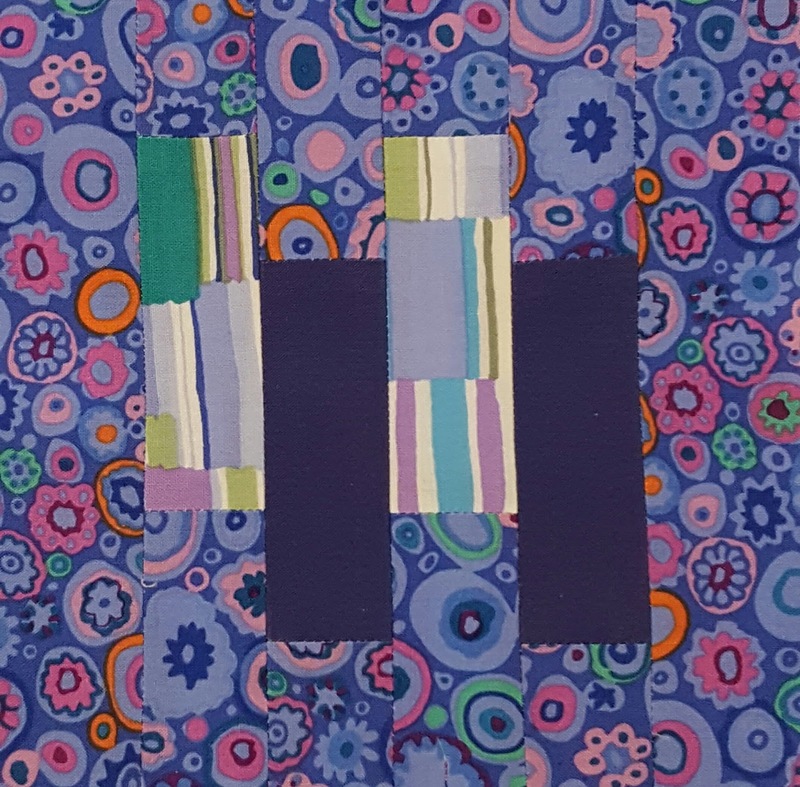 For me, this had to be sewing with Kaffe Fassett fabric! Some of Kaffe Fassett's quilts were displayed by FreeSpirit Fabrics. I knew right then and there that there would be some Kaffe fabric in my future! I knew that my local quilt shop carried Kaffe Fassett fabrics because I've seen it so many times before and for some reason never bought any! So I headed down there last week and picked up some blues & purples, something I wouldn't normally buy. Just looking for a challenge here, folks! I decided to make four random blocks from Tula Pink's City Sampler - 100 Modern Quilt Blocks. These are fast and easy blocks! I've had this book for quite some time. My friend Kelli Q gave it to me (I call her that because I have a lot of Kellis and Kellys in my life and she quilts; therefore, she's Kelli Q). She had Tula sign it for me since I couldn't attend quilt market with her. Sweet, right??? 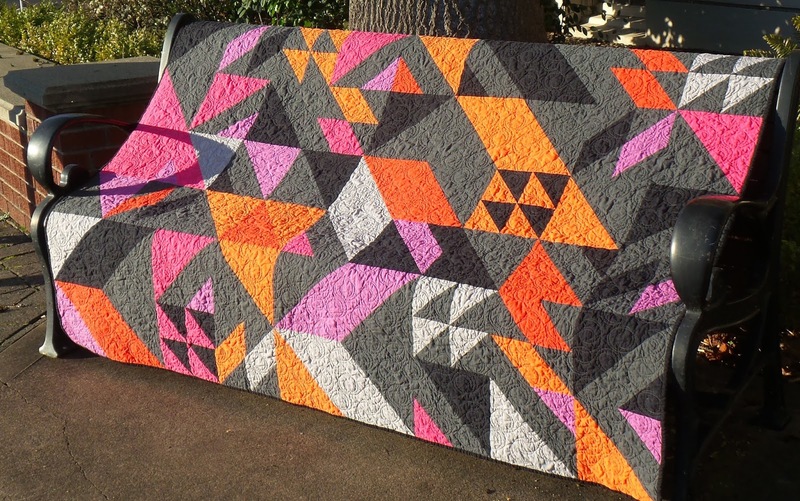 Don't these blocks look awesome using Kaffe's fabric? I added a purple solid that I had in my stash to break up the prints a little, but I think the blocks would look awesome even without the solid. OK, let's get on with the good stuff! The winner will be selected via Rafflecopter drawing on Saturday, Nov. 19th. I'm also giving away a $50 gift certificate to Upstairs Birdie Longarm Quilting (That's ME!) 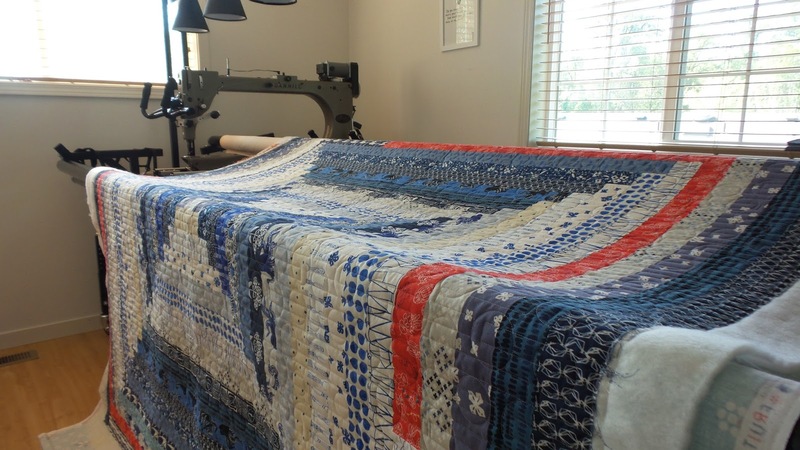 Do you have a quilt that you'd like to have quilted just in time for the holidays? The winner will be selected via paper pieces in a hat/bowl/box on Saturday, Nov. 19th. Heck! I might even do one of those Facebook Live videos! Thanks so much for stopping by! Don't forget to visit all of the blogs below for more chances to win prizes! 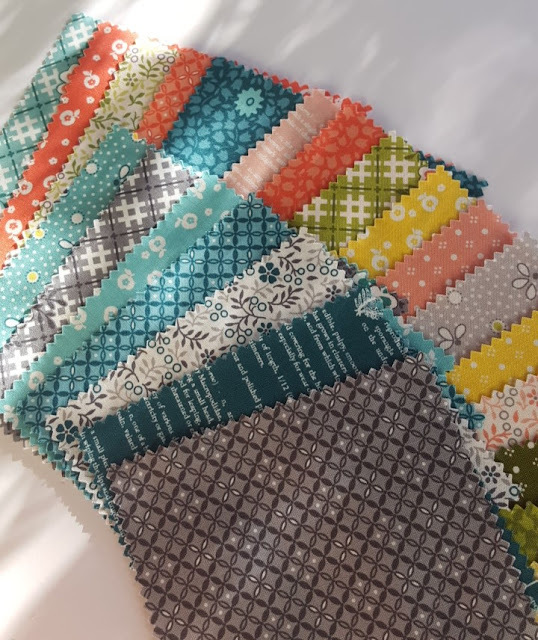 While at SewPro last month, I was one of the lucky ones who got a charm pack of Brenda Ratliff's One Room Schoolhouse fabric. Woot! This line is so great! While trying to decide what to make, I decided to go back and read Brenda's blog post where she described her design process. 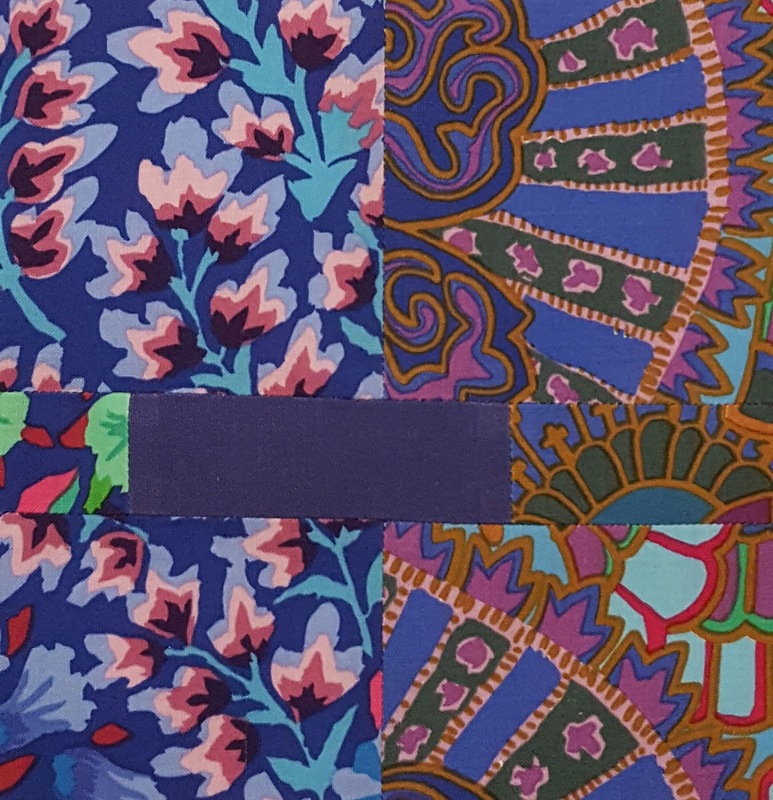 "I got inspiration from my vintage fabric collection. But this time, I really wanted a more late Spring/early Summer feel to the colors. I still looked for prints that were smaller for quilting. 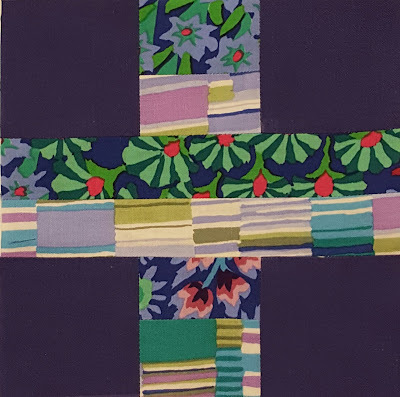 There are so many great quilting patterns out there that use small pieces and One Room Schoolhouse will work well with those types of patterns." Perfect! I just happened to be pulling fabric for a table runner for a table for my entry way and was looking for some ideas for quarter log cabin blocks. I came across this tutorial by Rita of Red Pepper Quilts. This fabric is perfect for small blocks for a table runner! Then I thought about how I only have one quilty thing on the wall in my sewing room....seriously, one thing! How is that even possible??? Hmmmm.....so maybe I could make a mini to hang on my wall! So I started cutting....and cutting....and cutting. I started my blocks with 2.5" squares, then added 1.5" strips using Rita's method. Then sewed all those teeny tiny blocks together. And then.....get this....I put this tiny little thing on my longarm to quilt it! Smallest quilt so far! And so quick! And just by pure luck, we happened to have a little bit of sunlight here in the Pacific Northwest, so I ran outside really quick and got a pic in my dude's garden. Aren't these colors awesome? I fell in love with all of the blues! If you have fallen in love with this fabric like I did, you're probably going to love her first fabric line, Pie Making Day! Earlier this week, I got a notification from Pink Castle Fabrics for a Pie Making Day + One Room Schoolhouse Stash Box, which I am adding to the top of my wish list for November! Doesn't everyone have a monthly wish list? ha ha! Got scraps? I sure do! And I'm starting to sort them to join the Stargyle Quilt Along! If you've read my recent post about SewPro, you may remember that Brenda Ratliff (Just a Bit Frayed and Pink Castle Fabrics) was one of the hosts. 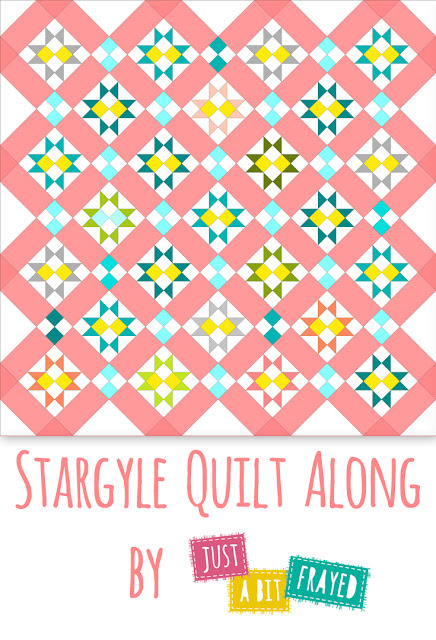 She has started a quilt along for a quilt pattern that she created called the Stargyle Quilt. And it's a scrap buster! Woot! That's just what I need! Well, kinda. It could take a bit to sort through my scraps because they seem to be stored here and there and everywhere! But I'm motivated because this quilt is awesome! And depending on how you lay it out, it could have a totally different look. Brenda has a few different layouts on her blog. If I go the easy route, I could just make it with all of my black and white fat quarters, which is SO tempting! But I also LOVE the look of a scrappy quilt! It's such a BIG ordeal to go through my scraps because seriously they're in several places in my sewing room. Things got all unorganized when I moved my sewing room last year when I got my longarm. I was keeping my scraps in two of those rolling drawer towers, organized by color. Then in my manic cleaning craziness one day, I decided to dump one of those towers into a big plastic bin and just get rid of the tower. Don't ask me what I was thinking. Now it's a little overwhelming to even think about going through them. Anywho....back to the Stargyle quilt! I'm thinking I'll most likely use my fat quarters because I have a ton of black. And why not make a black star quilt? I think that would be pretty cool! But I could totally change my mind between now and the time I climb the stairs to sort my scraps. If you're interested in a fun, fast, and really cool quilt along with no pressure, no deadlines, and no giveaways, head over to Brenda's blog -- Just a Bit Frayed. You can join anytime you want! And if you're a new quilter or just don't hang on to scraps (WHAT?!? ), Brenda also has some scrap packs at her shop Pink Castle Fabrics. Wow! The last week has been a whirlwind! 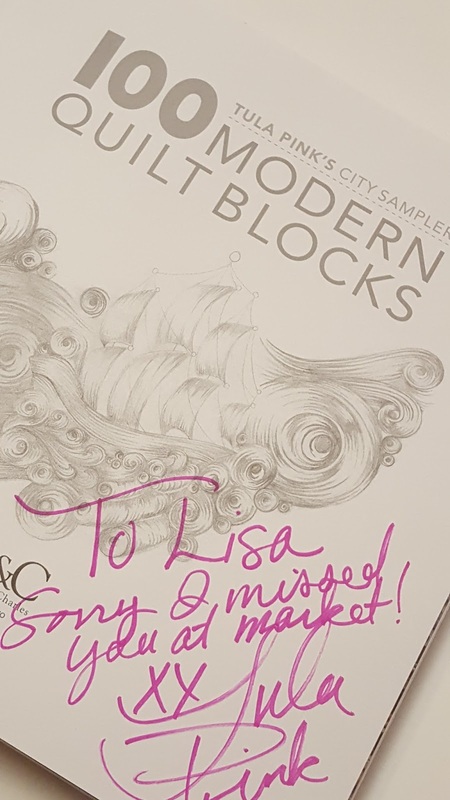 Last Thursday, I flew to Chicago with Caroline of Trillium Design in the wee hours of the morning for the first ever SewPro Convention, hosted by Brenda Ratliff of Just a Bit Frayed and Pink Castle Fabrics (affiliate link in sidebar), and Sara Lawson of Sew Sweetness What an amazing event!!! We were all there for the same reason - to take our business to the next level, to network with others, to work together because we're all doing what we love, some of us as a second career! The keynote speakers were Pat Sloan and Tula Pink, both amazing speakers! The teachers were amazing! And what made the whole thing so awesome is that we were able to make connections in such a small venue, with only about 150 attendees. It was an amazing experience, and I'm hoping this will be an annual event! 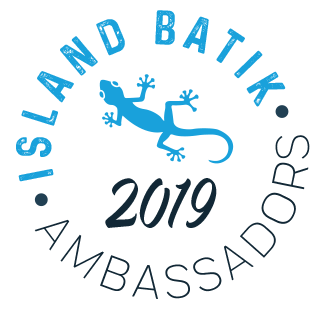 If you have the chance to go, do it! 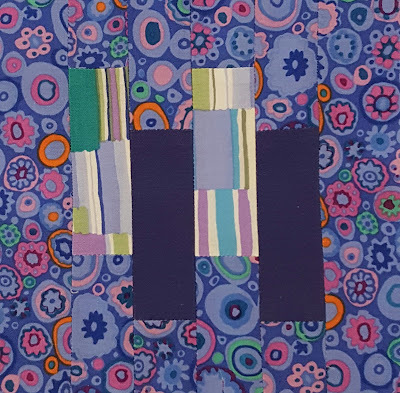 If you'd like to read more about SewPro, check out the blog post by Suzy Quilts, who also happens to have some pretty awesome stuff on her website, including some pretty cool quilt patterns. Brenda Ratliff had some of her One Room Schoolhouse charm packs available for those who wanted to make something and blog about it. So, of course, I got a pack! Hold tight for the next post featuring this awesome fabric! Hello? Is anyone out there? ha ha! You may have thought that I just gave up on blogging altogether, but wait....I have big news! For those of you who follow me on Instagram and Facebook, you have already seen my occasional post about my new business - Upstairs Birdie Longarm Quilting. This has been so fun getting started, and a little stressful at times since I'm still working full-time. 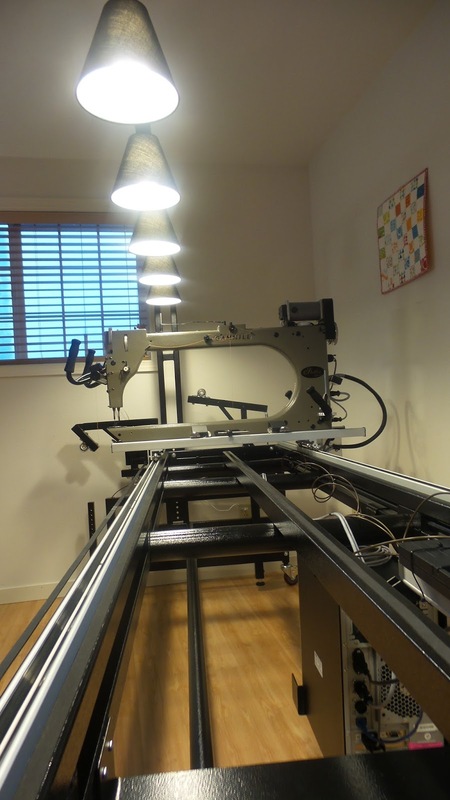 My 12-foot Gammill Statler Stitcher arrived in December 2015, was delivered and set up by Andrew of Andrew's Gammill Northwest in Wenatchee, Washington. This machine is HUGE! 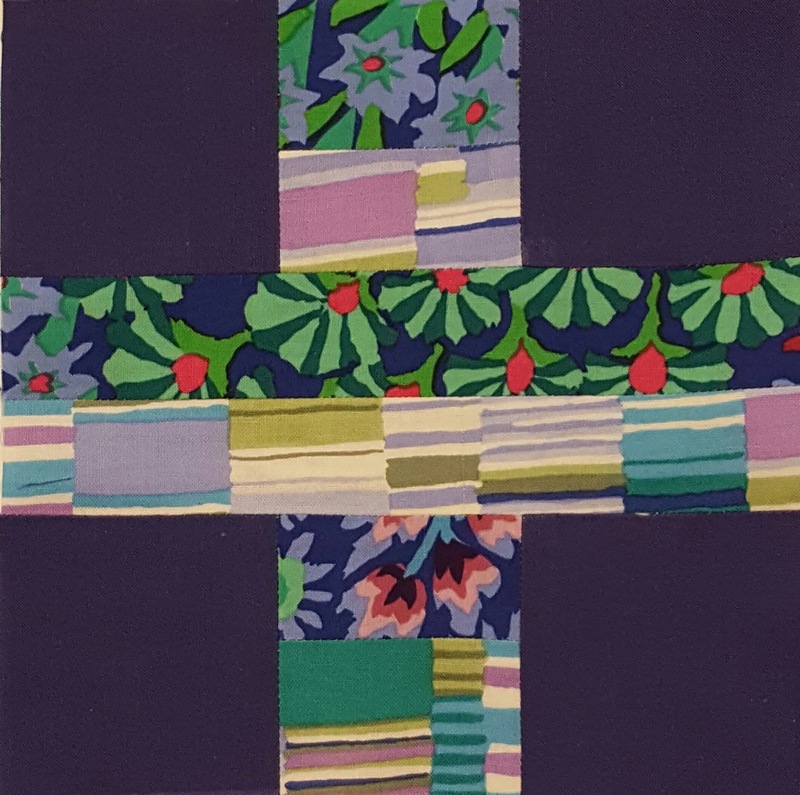 I started out the year quilting this QuiltCon charity quilt that was pieced by the members of the Corvallis Modern Quilt Guild. Then I quilted my Rebel quilt (see previous post for more pics). 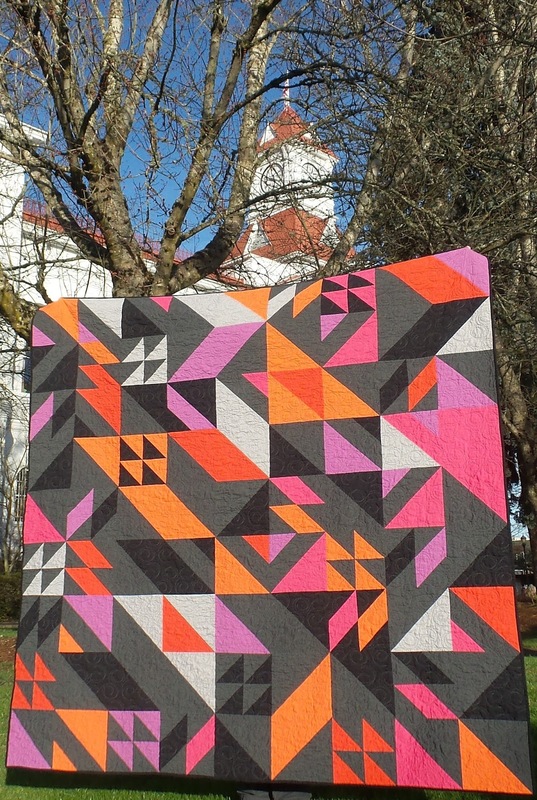 In March, my dude's cousin, Lori, came down from Washington with a quilt that she had designed and pieced for the annual fundraiser for Choir of the Sound in Seattle. Beautiful quilt, and the design that she chose was perfect! Sometime in April, Latifah Saafir posted a request for longarmers on Instagram, to quilt for Quilt Market. This is a big deal! Being new at this, I wasn't sure I should even respond to the request, but I took my chances. And so did Latifah. She replied to my email with the sweetest response. She said "I would love to support you by offering you this opportunity." WHAT? I was excited....and nervous...and grateful. 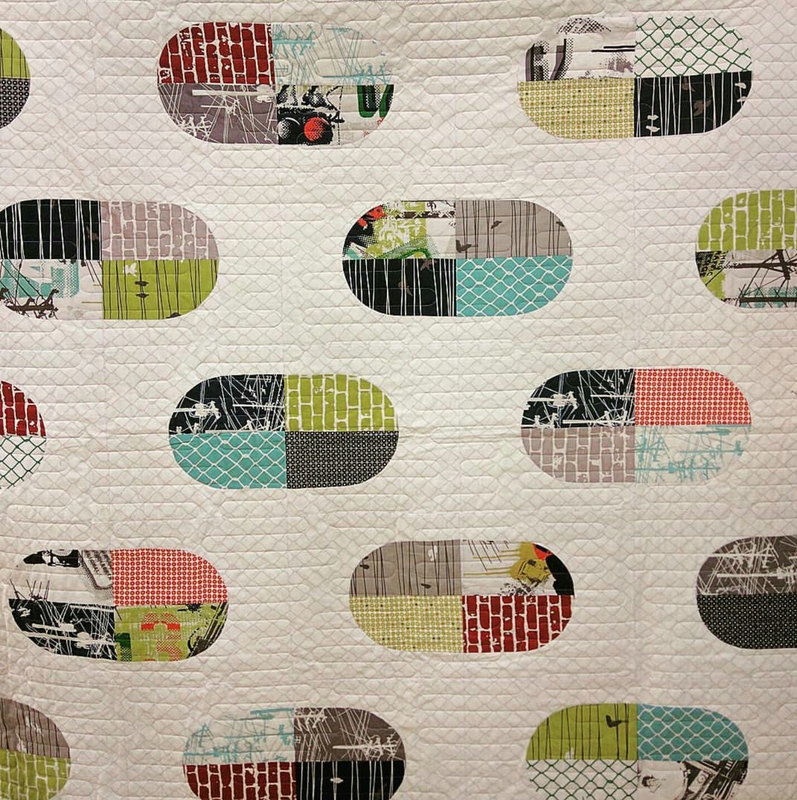 My friend, Kristen, of Circa15 Fabric Studio in Kirkland, Washington, was at Quilt Market and took this pic. I LOVE this fabric! 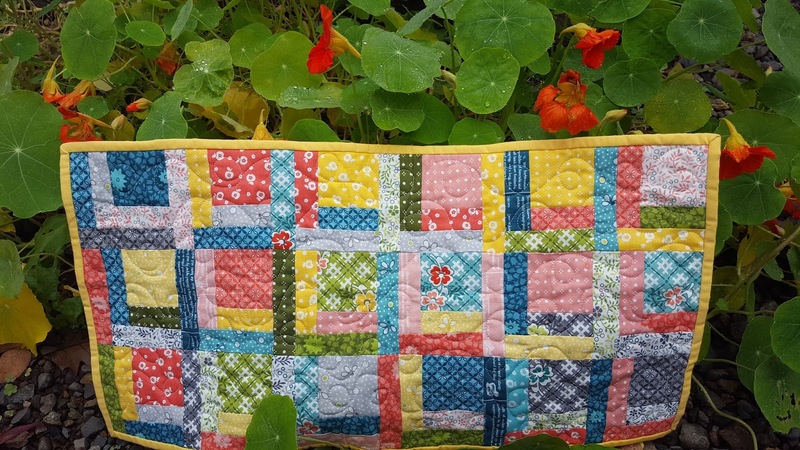 This Good and Plenty quilt pattern is free! Check out Latifah's lookbook for more fun projects! And my first customer just happened to be one of my favorite people - Dana of Winter Creek Cloth. I met Dana when I joined the guild. 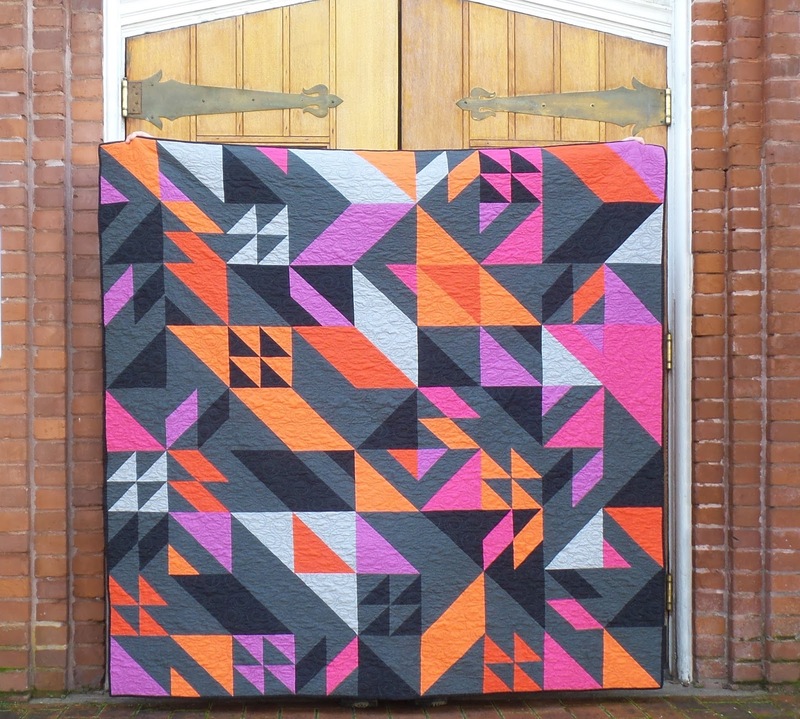 She pieced this beautiful courthouse steps quilt using Cotton and Steel Bluebird fabric. She decided on Quilter's Dream wool batting, which I think was the perfect choice! Stay tuned for more blog posts in the very near future! And if you're interested in having your quilts quilted by me, please check out Upstairs Birdie. All first-time quilts are 25% off (see website for details). Hey! I know it’s been awhile since I blogged, but I’m back! Today’s post isn’t all about me and my quilty adventures. OK, maybe just a little, but it’s so much more than that. 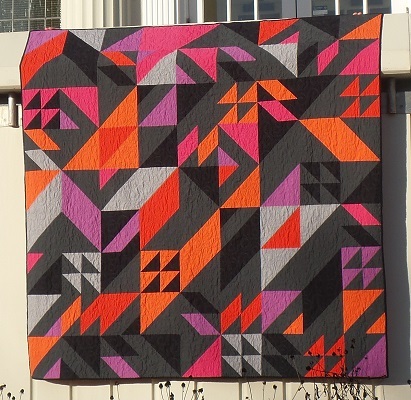 I’m sure you’ve seen the awesome Rebel quilt pattern by Libs Elliott on at least one of your social media feeds over the last year. 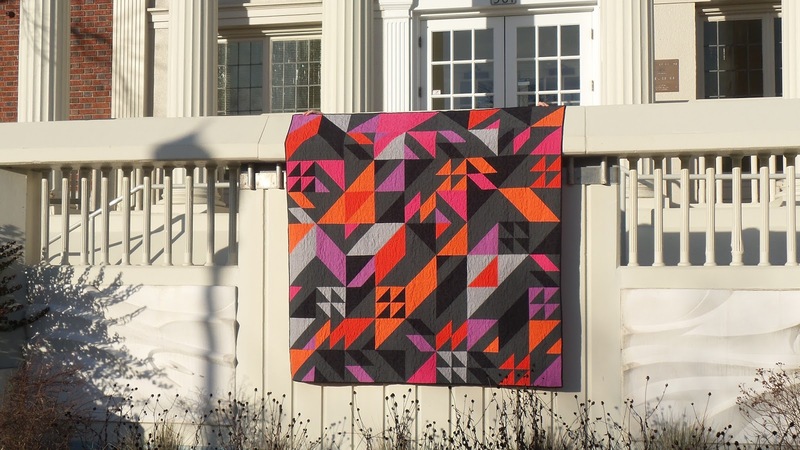 It’s an amazing pattern, and one that you should definitely put on your list of quilts to make if you haven’t already! 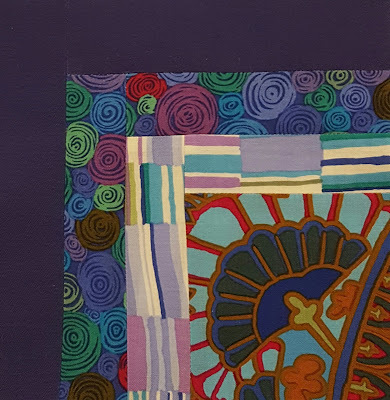 I loved the colors that Libs used in her original quilt, so I chose very similar colors when I made mine (see bottom of post for additional pictures). 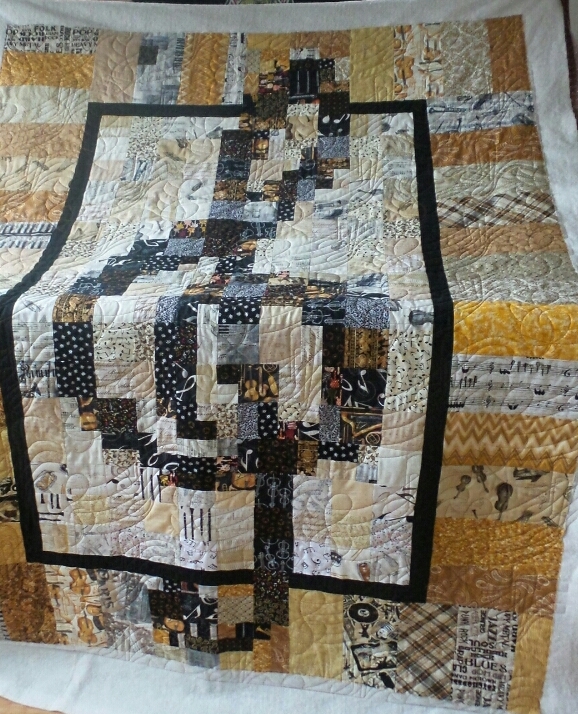 As much as I love this quilt, I’m giving it away. My dude and I walked around Downtown Corvallis to take these shots on one of our very rare sunny February days. The proceeds of this fundraiser will be going to someone special who is fighting to live right now. Her name is Christina Garrett, and she has been battling breast cancer for the last five years. She was told in December that she has six months to live. She and her husband, Curtis, are in Germany right now for last hope cancer treatment. All fundraiser details can be found at https://www.youcaring.com/christina-garrett-523896 Drawing will be held on March 21, 2016, when Christina & Curtis return from Germany. The Rebel Quilt by Libs Elliott in Modern Solids II by Alissa Haight Carlton on the front and Clementine by Heather Bailey on the back. Warm & Natural 100% cotton batting. Binding is machine sewn on the front, hand sewn on the back.